THE Division One title race is set for a nail-biting finish after Phoenix continued to chase Reddot with a fine win over a battling Moorehouse side. 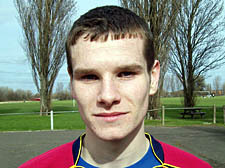 Mark Doyle (pictured) was the hero for Phoenix after his brace settled a far from comfortable victory. After a goalless first half, Doyle broke the deadlock with a fine header 20 minutes after the break. Leading goalscorer and man of the match James Cole set up Doyle for the second but Moorehouse made it a tense finish as they continued to press to the final whistle. League leaders Reddot left it late but ran out convincing 4-0 winners over AFC Brasenose. Liam Barnabie finally got the title holders off the mark after the break and earned man of the match accolades with his second, a curling right foot shot into the top corner. Sandwiched between Barnabie’s super strikes was Jason Medford’s 24th goal of the season. Skipper Mickey Dowsett completed the scoring, belting home a left-foot strike. Division Two leaders CS Maritimo sit four points clear after seeing off title challengers DOM 4-0 in a must-win match. Matthew Osborne hit two goals, with Raymond Tordecilla and Filipe Caetano also on target. Third placed Constitution suffered a 4-1 reverse at the hands of Hornsey, who sit just four points adrift of the top three. Mitchell Gubby scored twice, with Wayne McLaren and Neil Webster adding goals in a vital win for Hornsey. In the President’s Cup Pool A, Tergemo and Grupo Desportivo os Amigos de Londres shared the points in a 2-2 draw. Surreal Madrid A overcame MDM 3-0. Archway Allstars enjoyed the result of the day in Pool C, beating FC Bertoli 7-1.